The classic series of Doctor Who has always been lovingly derided for its lack of quality visual effects. However within this, an irony exists, in that – Who actually pushed the boundaries of what was possible on television and pioneered or created new technologies. The unique opening time-tunnel effect was created by feeding a camera image back through the same camera, creating feedback – known as “howling”. When the show began in 1963, the cutting/editing one scene into another was the height of the options available to production staff. So the show concentrated on producing detailed and quality modelwork effects instead. The BBC Visual Effects department were initially contracted to make models for the show but to ease the burden, Shawcraft Models were sub-contracted to help meet the demanding deadlines. The Dalek city on Skaro in The Daleks – 1963 was among many memorable model shots produced. Where the budget didn’t stretch, model shots were also used to visualize huge backdrops; such as the beach and temple scenes in Keys Of Marinus – 1964. The first true visual effect to be utilised was called “inlay” and involved the basic combination of 2 static TV pictures. The crashed ship model shot and footage of the actors combined in – The Rescue – 1965, was an example of this. This effect would be utilised many times in the show to afford the sometimes necessary sense of scale. It wasn’t until Troughton’s Evil Of The Daleks – 1967 however, that the show finally employed a dedicated Special Effects Designer; with further help from The Bill King Trading Post company. The next leap in visual effects came with the colour era of Pertwee and Colour Seperation Overlay – (CSO) or Chromakey. This allowed additional elements to be shot against a neutral colouring and then overlayed over a live action scene. CSO would become the staple effect of the show for the next 10 years. It was useful as it could be used to combine actors against static model shots (as inlay had) or to even overlay smaller effects shots onto live action. An example of this – done well, was the Spiridon creatures from Planet Of The Daleks, in which the invisible Spirodon interacted with objects such as picking up an object and moving it around. This was much more effective than using physical wires, which would have been noticable. The only problem with CSO, was a slightly yellow haze was sometimes visible; which betrayed the inserted element against the background footage. The next big leap (in the JNT era) was a digital video package, called Quantel. Which would allow images to be combined and for areas to be digitally painted out. Hence, the Tardis could now dynamically materialise into a live action shot for the first time. Rather than the previous staple of a static cut-scene between the Tardis being present and then disappearing – with no background movement. The early digital effects didn’t end there though as Scene-Sync was also introduced which meant that a model overlay could be filmed and tracked at the same time as a live action scene. Which meant that the model backdrop could move dynamically, with the actor’s environment. Elements of this were successfully used in Tom Baker’s Meglos – 1980 as the Doctor walked around Meglos’ giant superweapon complex. As the 1980’s drew to a close, Who experimented with early digital CGI – Paintbox and Amplex Digital Optics (ADO). Paintbox was a tool which could be used to enhance or change footage, much like a Photoshop of its day – by colourising or altering images. It was mainly used to alter the colour of alien skies, such as the pinky hues of Lakertya in Time And The Rani. Seventh Doctor's Tardis inserts done in CGI. 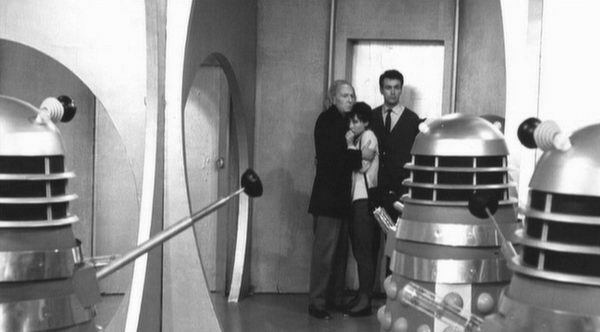 ADO was used to generate the Dalek lazer blasts in Remembrance Of The Daleks, Dalek infra-red view point and the Rani’s bouncing time bubbles in Time And The Rani. Another CGI software programme called CAL Video was used to generate the Seventh Doctor’s opening titles – another first for the show. Finally, CGI was also used to generate the opening titles and Skaro backdrop to 1996’s Doctor Who : The TV Movie. In summary, the show which is known for its poor special effects was infact a trailblazer for new technologies and visual mediums and it would bravely try new visual tricks, if it could enhance the story or scale of proceedings.